I took a little hiatus from TBR Challenge last year. An unintentional one since I did actually sign up in 2017. But then I decided I might try to write a book. Ha. Ha ha. Anyway I’m back now! And the first book of the TBR Challenge year was a great one. 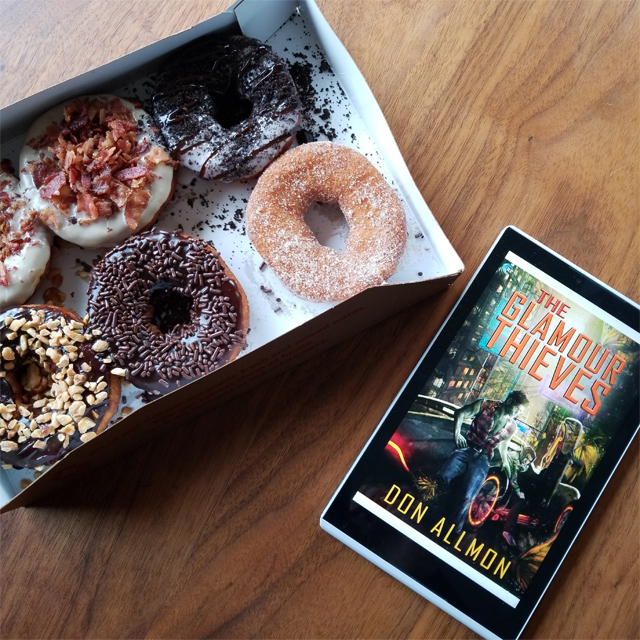 I picked up The Glamour Thieves by Don Allmon, which clocks in at around the length of a category romance at 164 pages. But this is not a category romance. This is a magicky cyberpunk m/m romance between an elf and an orc with a history who reunite to keep a gang from killing a friend who stole an AI from their network. Got all that? So actually, it’s a second chance romance! I usually read vintage Harlequins for January TBR Challenge so at least the trope matches up. I’ll start off with saying that this was a phenomenal book. It’s action-packed while not sacrificing relationship dynamics, quite a feat for such a short book. JT, a orc with a criminal past, has gone straight, acquired a home, an education, a legitimate business and an apprentice. So he’s not terribly keen when his his ex-flame Austin shows up. Austin is an elf (complete with magic aura and bow and arrows) who hasn’t quite shaken off the criminality. In cyberpunk, “criminals” are rarely the bad guys though. There is always someone worse, be it Chinese gangs, corporate ne’er-do-wells or double-crossing magicians. So Austin shows up, stolen Corvette in tow, to ask JT to help him out with protecting a friend who has “liberated” a piece of computer code from the wrong cadre of baddies. A stolen, ahem, I mean “borrowed” Corvette might seem like a weird present for a former lover, but JT is seriously obsessed with anything involving vehicles. He has cybernetic modifications that basically allow him to become one with anything with wheels, kinda like Iron Man and his super suit without the Jarvis. Austin is still hip deep in the criminal underworld so JT is rightfully wary of joining forces with him again, but the threat to their mutual pal Buzz is too serious to ignore and JT is too loyal to say no. Plus Austin is just so pretty. What happens next is a fast-paced, action-packed rollercoaster of a plot involving multiple shoot-outs, car chases, little skirmishes and big battles. While Austin and JT circle each other, JT also has a romantic history of sorts with Buzz. So when they end up on a road trip from the Bay Area out to Lake Tahoe with a wizard named Victor after the baddies looking for Buzz track him down, we get to see Buzz as a sort of foil for Austin. Buzz is a little further on the outskirts of the criminal element. His sister had been partners with Austin and JT before her death and a lot of the plot hinges on moving past the mistakes of prior years. If the book has one weakness, I would have liked to see Austin evolve a little more as a character rather than spending so much time on the relationship between Buzz and JT. But that’s frequently an issue I have with love triangle style books. In this case it didn’t mar the book at all for me because the rest of it was just so dang fun. Finally, the world-building is pretty robust, but if you’re not used to the shorthand of cyberpunk, it might not be enough context for you. Since it’s a short book and it’s clear the author wanted to keep the action moving without info-dumping (which I appreciated) it might help to be at least passing conversant with William Gibson or other cyberpunk writers. The concept of a ‘Net accessed virtual reality style via brain implants is perfectly normal within that realm. And sentient, semi-senitient or at least self-aware artificial intelligences are a common feature as well. If you’re used to urban fantasy, which is a much more common romance genre, the magic part of this book shouldn’t be too difficult to get a handle on. What this adds up to is something I’ve actually never seen before outside of the Shadowrun role-playing game and associated novels, which I was obsessed with as a teen: a magic-influenced, tech-heavy near future world with apocalyptic undertones. It’s even set in roughly the same time period, which makes me wonder if this is exactly what Allmon had in mind: Shadowrun, but gay. Whatever, I’m totally on board. It was my favorite world to play in back then and he totally did it justice. So I do worry slightly that if you don’t have that background, you might get a little lost in the details, but I adored the setting. The ending of The Glamour Thieves is more of an HFN than an HEA. I got the impression we would continue to get updates on this relationship in future books as it appeared that the sequel would feature JT’s apprentice, but when I looked at the description of the next book, it’s not at all what the end of The Glamour Thieves teases. Instead we’re going to get Buzz’s story with a new guy as the other hero so I’m a little confused why The Glamour Thieves epilogue looks the way it does. It’s all good though. Based on the strength of this one, I’ll go wherever Allmon leads. The Glamour Thieves was a terrific start to my TBR Challenge year. If you love m/m and love cyberpunk or urban fantasy, I highly recommend it. And it appears that I picked it up at exactly the right time because the second book, Apocalypse Alley, is due out on February 26th. By way of disclosure, the editor of this book was Sarah Lyons, who is a close friend, but I actually forgot she edited it until I was looking up the ISBN number to add the little about this book box to the end of this post. So I read it in completely unbiased fashion. For what it’s worth. I’m so glad you’re back with us! I love your cooking and books idea so much – and the photos you do for them. Looking forward to more of them. 🙂 Also loved the DecktheHarlequin idea – I found it late, or I would have joined you. Wow, that plot sounds really wild. I might have to try this one. So glad you’re back! I’ve missed Cooking Up Romance!